Mintres BV can oﬀer its customers a wide range of products and services based around diamond and other high performance ceramics. Our specialty is co-development of a product with a customer and then taking it to high volume production although production to drawing is also possible. Commonly known as heatsinks, these are really heatspreaders that take thermal energy from a concentrated source and spread it out thus reducing the thermal impedance and the temperature of the concentrated heat source or solid state heat pipes that take heat from one point in a system to another with low thermal impedance. These heatsinks are diced from wafers of diamond, aluminium nitride (AlN) or aluminium oxide (AlOx) and are usually square, oblong or round although any shape is possible. Heatsink can be structured in a number of ways with different coatings, shapes and electrical properties. These various standard possibilities are shown in a series of generic drawings based on heatsink material accessed through the links below. As a rule of thumb, diamond has the greatest thermal performance but at a higher cost; aluminium oxide is significantly cheaper but with a lower thermal performance whilst AlN sits between the two. Each heatsink can be provided with a number of functions. Gold coatings for wire bonding or soldering and for electrical conduction. AuSn and AuGe coatings for soldering. 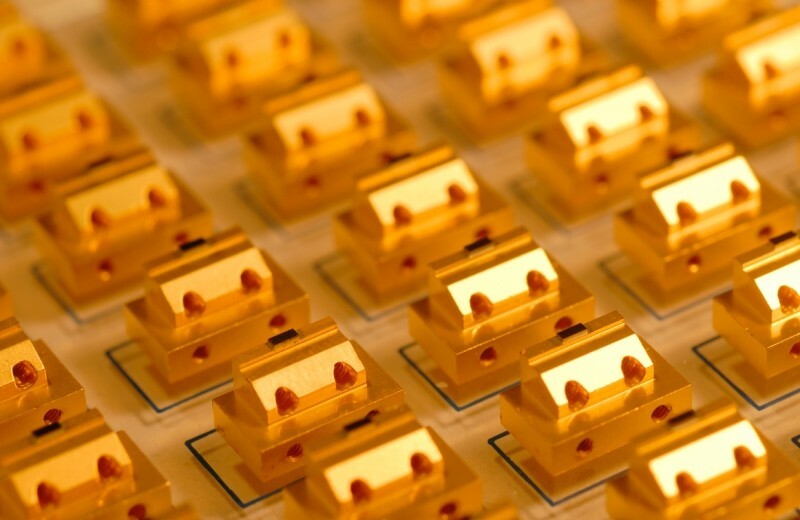 Patterned gold and/or gold-tin to provide electrical circuitry on the heatsink itself. This may be the top surface, bottom surface or both or even the side faces. Side face coatings or vias for top-to-bottom electrical conduction. Uncoated side faces for electrical isolation.